Garden plant labels or markers can become important as a gardener propagates more plants and grows more seedlings. 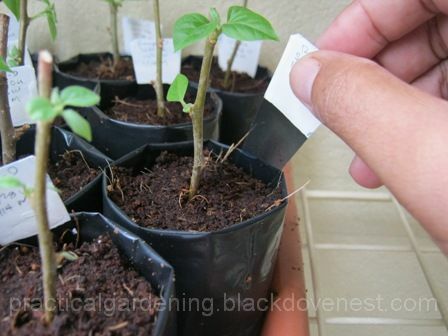 The common practice of labeling seedling bags with masking tapes is quite easy to do. It basically does the job in a quick manner and inexpensively. 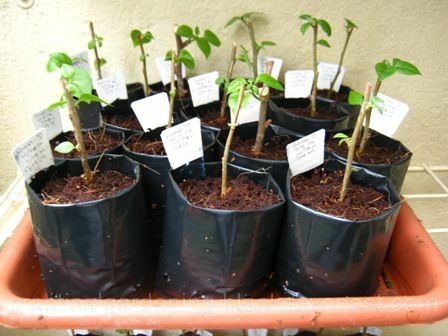 However, with the need to reuse seedling bags as well as the impact of long term use, masking tape labels may not be the best way to label garden seedling bags. 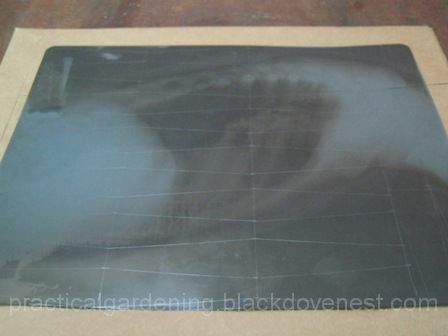 Here are a couple of problems this gardener has experienced with the use of masking tapes as labels for garden plants. Pencils don't write well on them. And even if they do, they're hardly readable. Ballpoint pens can write on them, but the ink can smear or bleed after several waterings. Adhesion problems. After several combinations of heat from the sun and frequent waterings, some masking tape labels lose their adhesion, detach and fall off. Sometimes the label gets lost and that already defeats the purpose of labeling in the first place. On the other hand, there are tapes that are very sticky and can be tough to remove after some time. This is especially so when the seedling bags are ready to be reused. The tapes appear cemented to the bag and would tear the seedling bag when pulled. Some DIY garden plant labels make use of popsicle sticks and cut out plastic jugs. The problem with popsicle sticks is they do deteriorate over time. They get mold and then rot. Cut out plastic jugs are quite durable but would need a pen marker to write with. Also, they're adequate only if a few garden plant labels are needed. Aluminum cans are another material oftenly used. 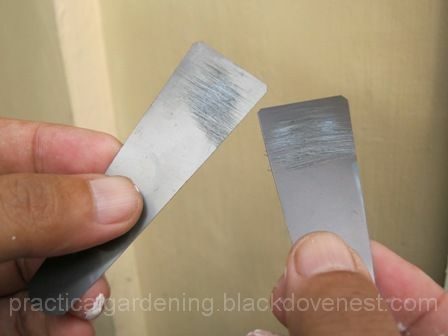 Tin snips would be required to cut garden plant labels out of them and, again, would require some time and effort just to make a few. This easy DIY project makes use of discarded medical films like x-ray's, MRI's, etc. Done correctly, one can make hundreds of these garden plant labels in a day. It's definitely economical for those who grow a large number of seedlings in their gardens or plant nurseries. 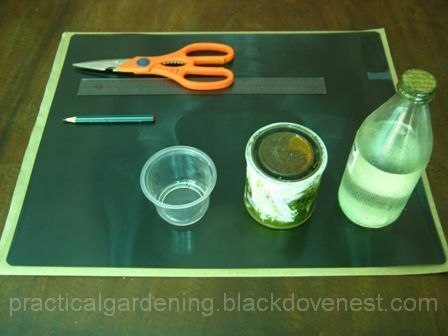 Lay the x-ray film on the table and draw the garden plant label shapes with a pencil and ruler. Each garden plant label measures 1 inch at the top and tapers down to 1/2 inch at the bottom. 10" x 8" 30 pcs. 11 3/4" x 9 1/4" 42 pcs. 14" x 11 3/4" 63 pcs. 17" x 14" 93 pcs. 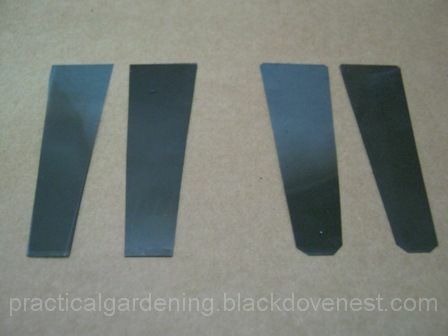 Cut the garden plant label shapes. Shown at the at the left are the two cut labels. Also cut the four pointed corners as shown by the two samples at the right. Lay a piece of sandpaper, rough side up, on a table. 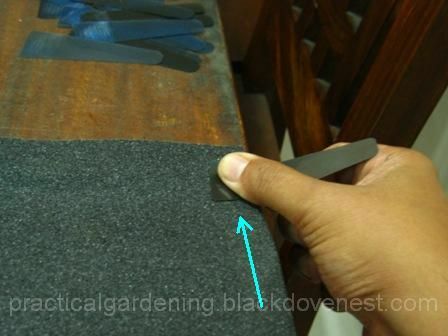 Rub the top part (1"-wide end) of the garden plant label to scour it. Do this on the other side of the garden plant label also. Shown below are the scoured top parts of the garden plant labels. 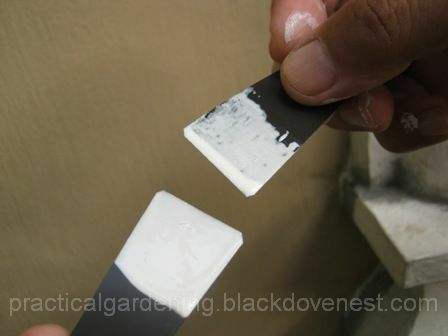 Scouring the surface of the garden plant label will allow the flat wall paint to adhere properely. Hold the bottom part (or the narrow 1/2" end) of two garden plant labels with both hands. 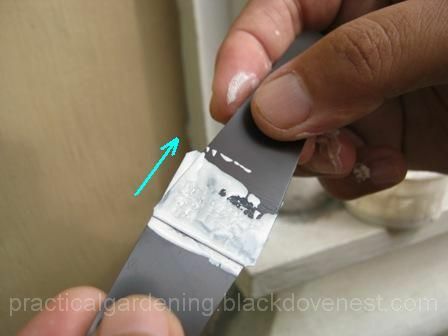 Dip the top part of one garden plant label into the flat wall enamel paint as shown below. Let the top part of the two garden plant labels touch flat against each other. Then, with an even stroke, slide away the garden plant label on the right in the direction as shown. The light brushing of the right garden plant label results in a smooth even surface for the left garden plant label. Do the same for the surface on the other side of the left garden plant label. Dry the newly painted garden plant labels under the sun. Do not let the newly painted surfaces touch each other or any other object. Here, pairs of newly painted garden plant labels are sandwiched between a seedling rack and garden seedling bags for drying. 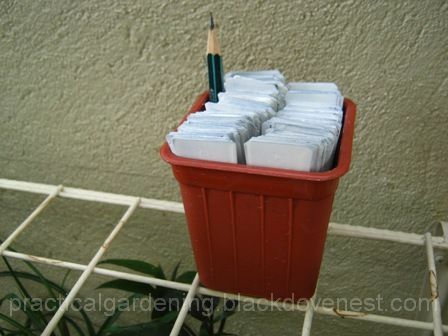 Here's another way of drying the garden plant labels - by letting them stand inside the cells of a seedling tray. Store the dried garden plant labels with a pencil in a container. A pencil writes easily on the painted surface of the garden plant label. 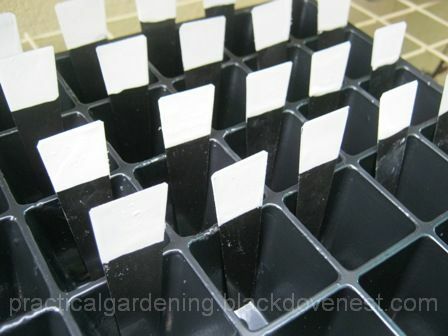 Because these garden plant labels are thin and flat, you can store hundreds in a small box. 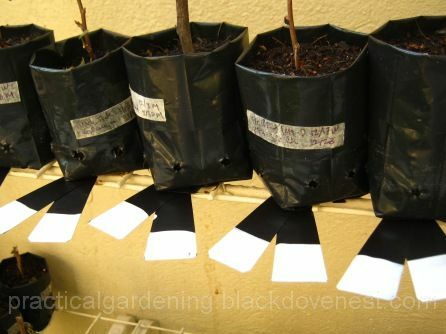 To use, write on the painted surface and then position the garden plant label between the soil and the inside surface of the seedling bag or small pot. For consistency, the written surface should be facing the inside of the seedling bag. Shown are the neatly labeled garden seedlings. Hundreds of garden plant labels may be made with just one small can of flat wall paint, so use a little paint at a time. 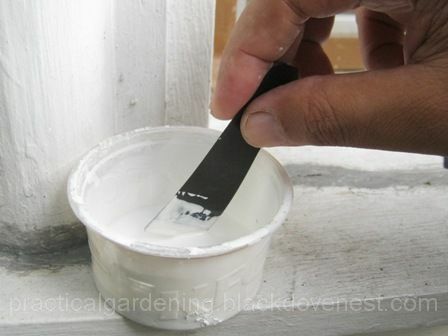 If the paint is too thick or viscous, add a bit of paint thinner and mix in a disposable cup to dilute it. If thick, the paint binds and results in an uneven rough surface. 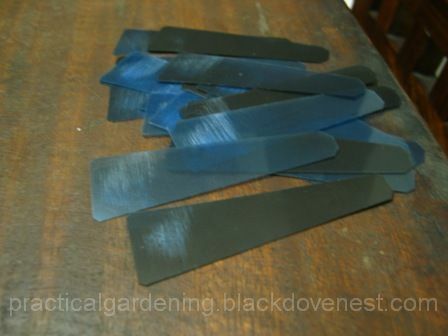 When drying the garden plant labels, ensure that the newly painted surfaces do not touch any object.